In the Industrial Business, the solid performance of measuring instruments continued from 4Q FY2016, and sales expanded further. The business achieved high profitability, with the operating profit ratio exceeding 20% for the second consecutive quarter. Measuring instruments continued to benefit from the tailwind provided by the use of OLED displays by a major manufacturer of mobile equipment. Sales to mobile equipment manufacturers in China also grew. Materials and components include three business units, the revenue for each of which is presented on the next page. Performance materials, continuing from the previous year, focused on high value-added products, and sales volumes of both VA-TAC film and Zero-TAC film for IPS grew year on year. However, due to severe price pressure, revenue declined. 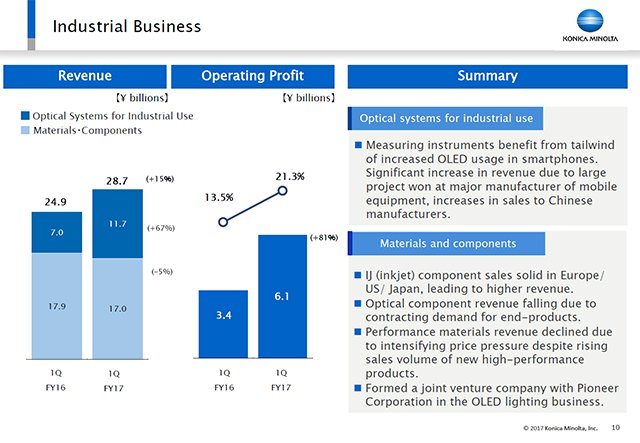 In optical component, lenses for industrial and professional use posted lower revenue due to a declining demand in end-product markets. In the inkjet (IJ) unit, industrial inkjet heads were solid in the US, Europe, and Japan, resulting in higher revenue. With regard to the OLED lighting business, our joint venture with Pioneer Corporation began operations in the beginning of June.